Based on its principle, the cupola furnace is a shaft melting furnace, it is filled with fuel (coke), metal charge (pig iron, circulation material, scrap steel) and slag-forming additives (limestone) from the top. In the bottom part of the furnace, combustion air (blast) compacted by a blower is fed into the furnace shaft by nozzles (see Hot blast nozzle, Blast pressure). During this process, the counter flow principle is used to transfer heat from the combustion gases to the charge until it is melted (Figs. 1 and 2). Thus, the required energy is generated in the cupola itself, i.e. without any transfer, and it is used at the site of generation. The quality of the fuel (coke, HC coke) and the combustion process itself must be reproducible since all fluctuations have an impact on the melting process. Even today’s state-of-the-art cupola furnaces have a simple design, are reliable in operation, low-maintenance and easy to operate. The investment costs are low compared to other units. Combustion of the coke generates CO2 and heat (eq. 1). Thus, it is possible to express a defined combustion ratio (eq. 3) for the thermal utilization regarding coke combustion. Accordingly, the exhaust gas contains high concentrations of carbon monoxide. It can be extracted laterally from the furnace (extraction below throat) and thermally recovered. 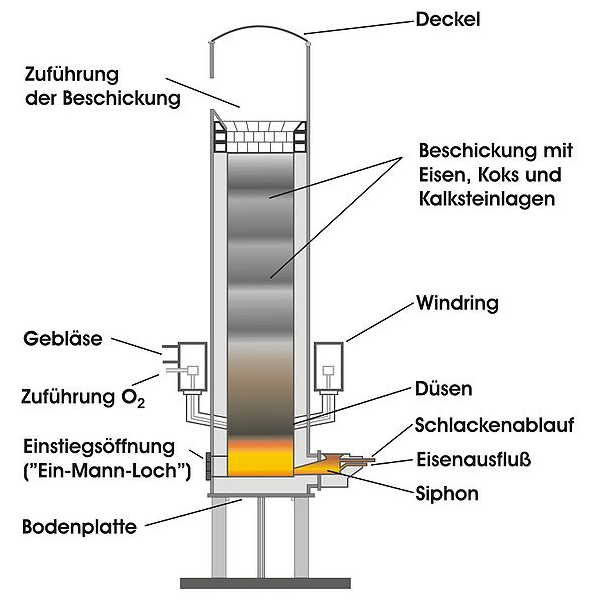 If the exhaust gas is extracted in the feed area (extraction above throat), false air is introduced at least during charging, rendering thermal recovery inefficient. In cold-blast cupolas, cold combustion air is supplied to the furnace as the exhaust gas is not thermally recovered (extraction above throat), this usually refers to small-sized furnaces (melting rate of approx. 2–10 t/h). 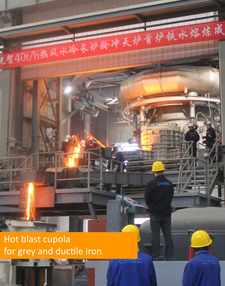 The cold-blast cupola furnace has a high specific coke consumption since a large part of the energy is discharged together with the exhaust gas in the form of carbon monoxide. It is an excellent melting unit (furnace efficiency of approx. 60%), but an uneconomical superheating unit. Cold-blast operation is known to have difficulties reaching high spout iron temperatures, unless cokecharge and blast volume are increased to the detriment of the melting rate (see Cupola furnace network diagram). Moreover, cheap scrap steel can hardly be used and relatively wide tolerances must be applied in order to ensure accurate analyses of the spout iron. The energy consumption can be reduced by introducing secondary air above the melting zone and injecting oxygen. Washers and increasingly also fabric filters are used for dust removal (see Dedusting). In hot-blast cupolas, the CO-rich exhaust gas is combusted in a heat exchanger (recuperator) and the resulting heat is used to preheat the blast, the blast temperature then being about 400 to 600°C. This means a considerable improvement over cold-blast operation. The economic efficiency is increased, more scrap steel can be used and a relatively high spout temperature can be obtained in a precise manner. The melting zone is closer to the nozzles than in cold-blast cupolas. Particular benefits include a guaranteed reliable production process with only little spread in iron composition. As can be seen in Fig. 3, the energy density in the combustion zone decreases with increasing blast temperature and the combustion zone is shifted in the direction of the nozzles. 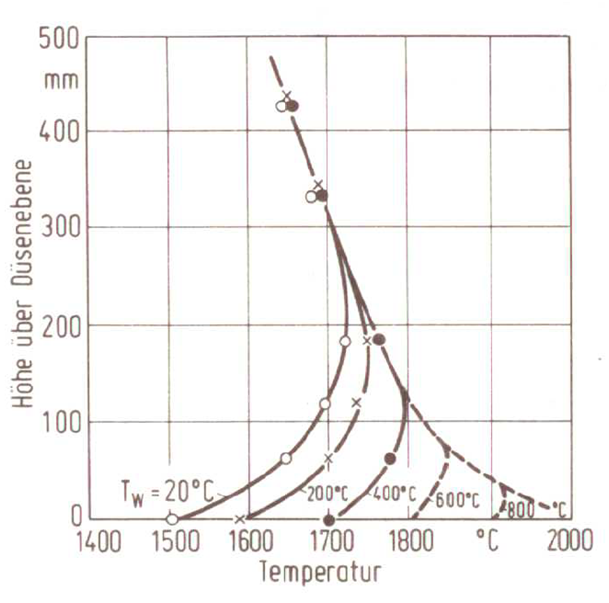 In addition, the diagram shows that the furnace temperature in the combustion zone increases, while the throat gas temperature (in a greater height above the nozzles) remains the same. Dust removal can be accomplished by wet (washer) or dry means (fabric filter); today, fabric filters are considered state of the art. In line with the current state of the art, a long-term furnace can be designed with or without a lining. In both cases, only one furnace is used for melting, i.e. without the cumbersome daily change. However, such a mode of operation is only reasonable for at least two-shift operation, the furnace being interrupted (see Interruption) in the meantime. Depending on the metallurgical requirements, the long-term furnace is equipped with a separate slag siphon or with a pressurized siphon. In pressurized siphon operation, iron and slag do not accumulate in the furnace but are immediately drained after dripping off. However, this has a slight negative impact on carburization. Therefore, this design can be used to produce iron with a low C-content, which is particularly interesting for foundries when it comes to the production of malleable cast iron. The liningless furnace does not have any refractory lining in any part of the shaft as is suggested by the term liningless; however, underneath the nozzles it is equipped with the same permanent lining as the long-term furnaces with lining. 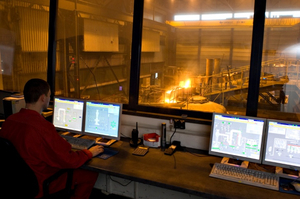 Advantages of the liningless furnace include a reduced lining effort and the somewhat longer furnace campaign, while long-term furnaces with a lining provide the benefit of lower heat losses, ultimately resulting in reduced coke consumption and better energy utilization associated with the above-mentioned benefits for the environment and the climate. 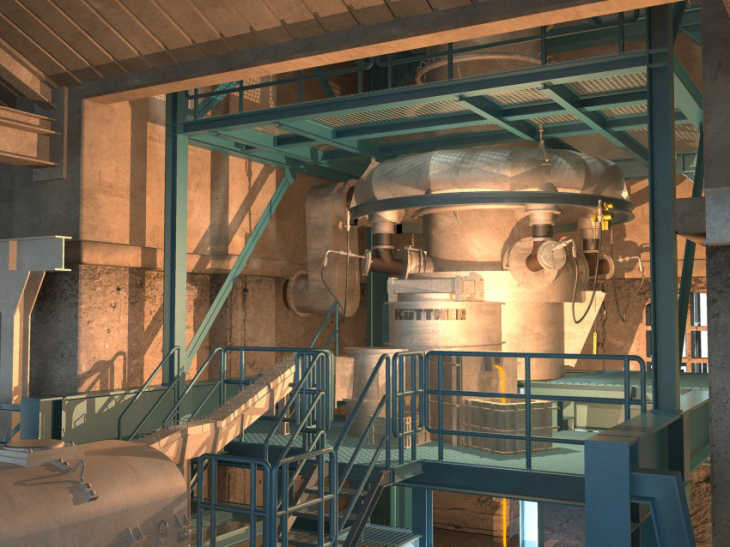 The video shows one example of a liningless long-term cupola furnace. With a long-term hot-blast cupola furnace with lining (brick-lined furnace shell), heat losses can be reduced to a minimum. A special compensating siphon is used to adjust the slagbath height according to the desired carburization, making it possible to change the dripping zone in the cupola seen from the siphon. The compensating siphon can also be adjusted such that a dry bottom is created in the furnace, i.e. the compensating siphon can be operated as a pressurized siphon. Either way, the dripping zone in the furnace is independent of any fluctuations in pressure. Thanks to the use of the primary energy source natural gas and its high thermal efficiency, this relatively new melting variant is able to spare resources and to reduce the CO2 footprint. The separate feeding of energy source and melting material as well as a steplessly adjustable burner control permit flexible production. The emissions of NOx, CO, SO2 and the dust emission are considerably below the legal limits. Critical aspects of cokeless melting are often considered to be the slag flow due to the low temperature level in the shaft section and the lack of carburization along with the associated difficulties when using high scrap steel volumes. However, it is possible today to use a scrap steel fraction of up to 40%. Slagging is considerably reduced compared to copulas using coke. The first slag is only formed approx. 2 hours upon the start of melting. The gas consumption per ton of liquid iron is about 49 Nm³/h (approx. 530 kWh) at a tapping temperature of 1420°C. As with other cupolas, steel scrap, scrap iron, return scrap, pig iron and slag forming agents can be used as charging materials. Depending on the requirements, the iron can then be cast or adjusted to the required analysis and temperature in an induction furnace. One major metallurgical advantage of this furnace type is the low sulfur content in the molten base iron which can be approx. 0.01%. There is no coke-related addition of sulfur. In order to guarantee uniform melting conditions, the furnace is equipped with state-of-the-art gas burners. Each burner has its own gas, air and oxygen valves for precise regulation of burner performance. This also ensures easy adaptation of the melting rate to the given requirements. After introducing the ceramic bedding on the water-cooled grate, the empty furnace is preheated for about 45 minutes. Then, the cokeless cupola furnace is loaded with metallic charge materials and slag-forming agents. The hot flue gas from the natural-gas-fired burners flows through and superheats the layer of ceramic spheres and ensures that the charge column is thoroughly preheated. Afterwards, the exhaust gas is cooled in a gas/air exchanger and cleaned by means of a dry filter (see Dedusting). The charge material melts, is superheated while it is in contact with the ceramic bedding and drips into the hearth. 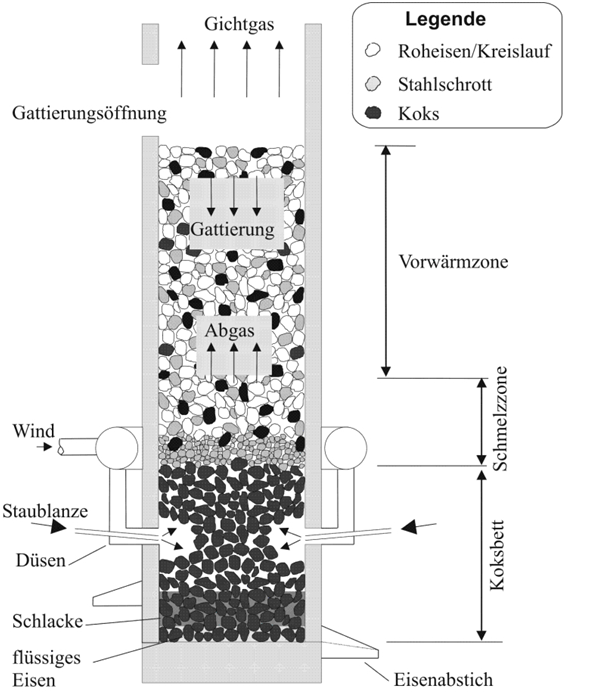 In the siphon, slag and iron are separated (Fig. 4). Using this method, the melting process already begins when starting to fill the furnace. Roughly 15 minutes later, the first iron pours out of the siphon and into the electrically heated superheater. Here, the desired iron temperature is regulated electrically and the composition is adjusted by adding the appropriate alloy. Figs. 5 - 7 (Küttner GmbH & Co. KG) shows application examples of cupolas.